Our kids need to hear words of affirmation from us each day. Sometimes it’s easy to forget that our kids have the same deep, emotional needs we do. But when we go out of our way to sincerely compliment them, it will boost their self-esteem and our connection with them. 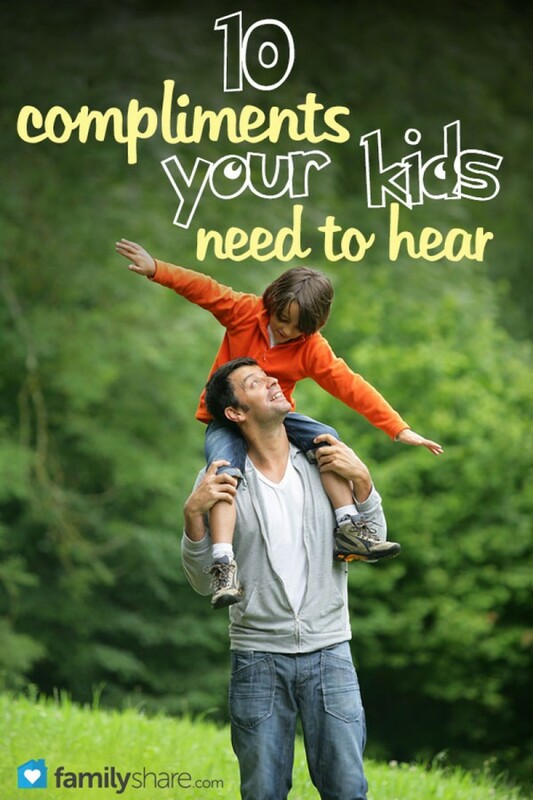 If you’re looking to form a deeper connection with your kids, consider how you can tailor one of these 10 compliments specifically for them. Do you fall into the trap of only congratulating your child when he succeeds at something? Instead, try to complimenting his efforts whether it is on the football field, in the classroom or helping around the house. Teach your kids that it’s the effort, not always the outcome that matters. This is the fastest way to build healthy self-esteem. If we don’t make an effort to get close to our kids, they will run in the opposite direction. When your child chooses to spend some time hanging with dear old dad, compliment his use of time. Let him know that you appreciate his effort to reach out. As our kids get older, we lose some influence in the friend department. When your kid brings home friends that you approve of, let her know. Despite evidence to the contrary, she does want your approval. She will listen to your opinion about friends when it’s presented in a positive way. Our kids’ efforts at independence sometimes fall flat, but that doesn’t mean we should berate the poor kid. Any time your child tries for independence, acknowledge and reward her efforts. One of the best gifts we can give our children is a healthy body image. When you compliment a feature the child can’t change, such as eye color or body composition, it sends the message that beauty is something you either have or are lacking. Instead, compliment proper grooming, appropriate clothing choices and a winning smile; all things that your child can control. Sooner or later, we have to do things we don’t want to do. Leave your kid with the message that attitude counts, even when you find yourself in a bad situation. Childhood and adolescence come with milestones. Don’t let them pass unnoticed. When your child masters a difficult math concept or brings home a learner’s permit, make your enthusiasm match your child’s joy. Share in his triumphs. At times, children get caught feeling like they are below their parents. While parents deserve respect, kids need to hear that they bless your life as much as you bless theirs. Tell them how much you appreciate their creativity and energy and how their example influences you for good. Sibling relationships can cause some drama, so compliment your children when they make an effort at peacemaking. When your kid diffuses an argument, he deserves acknowledgement, both for his own good and to inspire other children in the home. Bad days come and go. Kids grow up and change, but your child needs to feel secure in her place in the family. As she goes to school, gains independence, and eventually leaves home, she needs to know that she will always hold a special place in your heart and in the family unit.